Cooking and baking especially with spices requires very good measurement. And opening spice tins and jars and extracting the goodness inside can be a real nightmare. The “shake and pray” method of try to fill a measuring spoon with spices usually ends with too much heaped on the spoon and twice as much scattered all over the kitchen. 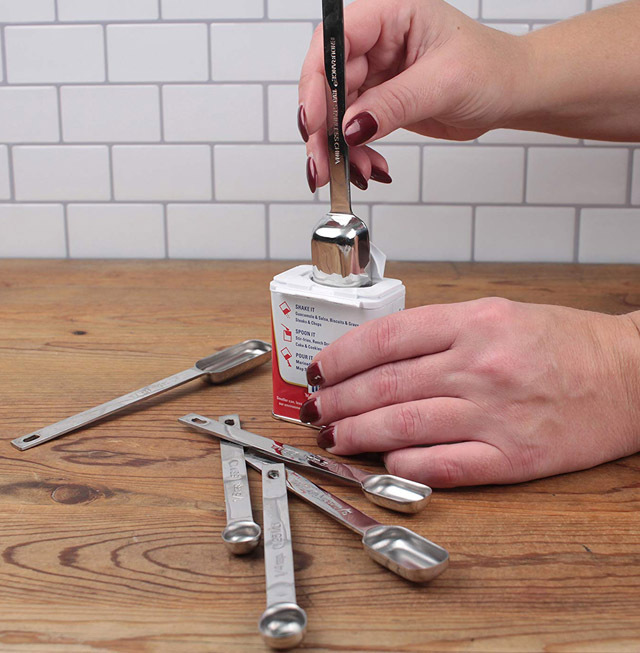 RSVP Endurance brings us their solution for spice measuring spoons by making it fit. The spoon handles and narrow measuring spoon are from ¼-inch wide up to 1-inch wide has a 6-1/4-inch overall length, fit inside the narrowest openings. This spicy flatware comes in 1-tablespoon, 1-teaspoon, 3/4-teaspoon, 1/2-teaspoon, 1/4-teaspoon and 1/8-teaspoon sizes. Measurements are permanently stamped onto the 4-1/2-inch long handles in US and Metric measurements. And of course they are dishwasher safe made of 18/8 stainless steel.